It’s finally – finally! – almost T-shirt weather across Canada. And while we know that nothing beats the Girl Guide uniform T or your favourite camp shirt, there’s something pretty awesome about girls designing their own T-shirts. As we head into the weekend and get ready to don short-sleeves for some outdoor fun, GirlGuidesCANBlog shares these fashionable notes from girl members who set to work on designing their own threads. 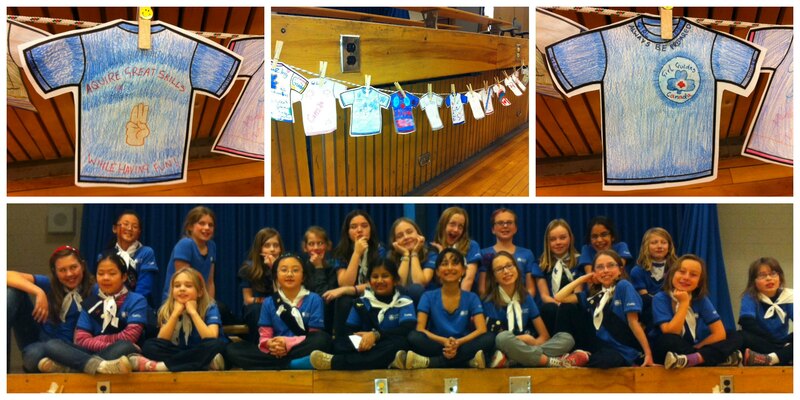 Earlier this Guiding year, the 2nd Kanata Guides from Ottawa decided to have a T-shirt designing contest. We did this as part of the Canadian Guiding Badge. All girls in the unit were able to express their ideas, understandings and opinions about Canadian Guiding. Everyone had a chance to participate in the contest. Everybody designed their own T-shirt on a piece of paper. We used a variety of pencils, markers, and colour pencils. The T-shirts showcased colourful and creative pictures of all the things we do in Guiding. We had an amazing time and can`t wait to do other exciting activities like this! By guest bloggers Isabelle Dault, Hannah McCormick, Divya Menon and Katherine Fitze, members of the 2nd Kanata Guides. This entry was posted in Awesome Activities and tagged badges, crafts, Guides, meeting ideas. Bookmark the permalink. That’s a fun idea. I was thinking it would also have been cool if you picked a winner and then had t-shirts made with the winning design.